Smart kitchen needs smart appliances. So, how can we forget Juicer Mixer Grinders– one of the most important kitchen appliances for all your juicing, mixing and grinding needs? We, the people of India are spice lovers, and spices give the most authentic taste to all of our dishes. But to prepare these spices for any dish is quite difficult if we don’t have the perfect tool. Here comes the role of Mixer Grinders in our kitchen. How awesome when the juicers are also attached with the Mixer Grinder? Juicer Mixer Grinders make the cumbersome task of juicing, chopping, grinding, and mixing easier and thus helping every homemaker to make a perfect dish. Plus, there is no hassle to use it likewise the traditional grindstones even the taste remains natural. Whether to chop and grind the foodstuffs like dry fruits, spices, onion, garlic, etc. or to make various chutneys like green chilli, tomato chutney, mint chutney, etc., the mixer grinders can do all in no time. Also, you can make different kind of shakes, and whip any liquid whatever to you want in a very easy way as well as make fresh juices with the Juicer Mixer Grinders. Type- There are two types of mixer grinders. One is known as blender or mixer grinder that is commonly used for the purpose of grinding and mixing things. The other one is Juicer Mixer Grinder- the mixer grinder attached with a juicer. It means with this type not only you can grind and mix things up but also make different kinds of juices very easily. So, it is advisable to choose the one having juicer attached to it. Number of Jars- The more the jars, the more tasks your mixer grinder serves. You must go for the one with at least 3 pots. The large one for making shakes and juicing purpose, the medium one for grinding spices, and the small one for making chutney, etc. Power of the Motor- This is one of the most important things you must consider. The power of the mixie motor is measured in terms of watts. The best model comes having at least 500 Watts of power. But if you want heavy mixing and grinding tasks, go for the one having at least 800 Watts. Speed- The best models comes with variable speed settings. So it is advisable to choose the one having different speed options. So you can operate it easily at different speed depending upon the task. Auto Shut off- This feature saves the motor of the grinder from damage. It means if the mixer grinder is overloaded, the mixer grinder automatically switches off. Safety Lock System- This feature makes the mixer grinder starts working only in that condition when the jar is properly locked with the base unit. The latest models come with double lock feature ensuring more safety. 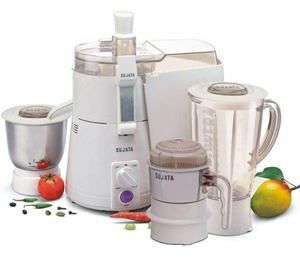 Are you fed up with your old juicer mixer grinder and planning to buy a new one but still confused which one to buy? As there are a lot of models and brands are available in the market, so the confusion is but obvious. 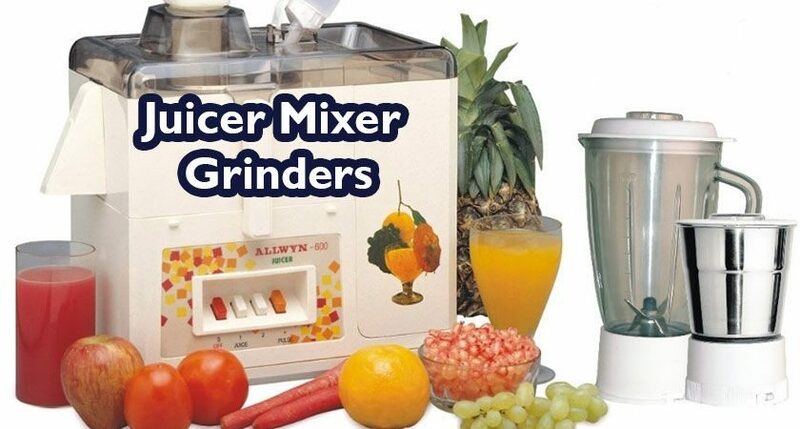 But don’t worry; we have made your task easier by lining up the best and latest models of juicer mixers grinders that can serve all your juicing, grinding and mixing needs very efficiently. Check below the list of 10 best and latest juicer mixer grinders and then go for the full review of each model and pick your favorite one. 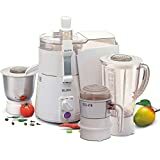 This juicer mixer grinder from Philips offers an excellent juicing, mixing, and grinding experience. The stainless steel blades chop and grind the stuff in no time. Also, this one comes with the bigger round shaft that enables you to extract the juice very easily. The online transparent pulp chamber and removable blades ease the cleaning process. This juicer mixer grinder also comes with the jar locking feature that firmly fixes the jar to the base unit ensuring safety. 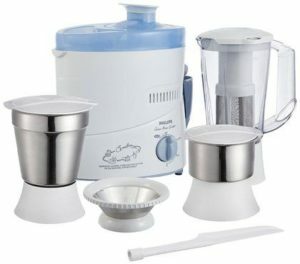 So get this one for fine mixing and grinding as well as convenient juicing at home. If you want a hassle-free cooking experience in your kitchen, this model of Philips juicer mixer grinder is surely be the best buy. The compact size of this model doesn’t take much space in your kitchen and lets you store it very conveniently. The very best is its stainless steel blades that can perfectly blend even the harder foodstuffs very easily. It comes with 3 Jars – the blender jar, the multipurpose jar for grinding and pureeing, and the last one chutney jar, so all you can do very easily with these jars. This juicer mixer grinder also has the variable speed settings so you can use it accordingly whatever you want to. Superior performance and best mixing, grinding, and juicing is all this product boasts about. 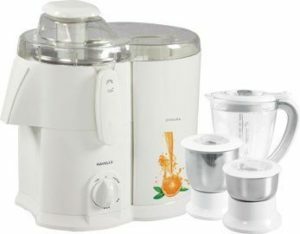 This juicer mixer grinder comes with 600 W powerful motor that efficiently do its job in no time. Whether you want to make your favorite shakes, or want to mix and grind spices for curry, or chutney making and even extracting juice of your favorite flavors, it can do everything for you. This mixer grinder is equipped with powerful short-armed blades that let you churn out even the toughest ingredients very easily. The leak-proof jars with advanced locking system enable you to use it very conveniently. This all-in-one kitchen mate is perfect enough for all your blending, whipping, and juicing needs. 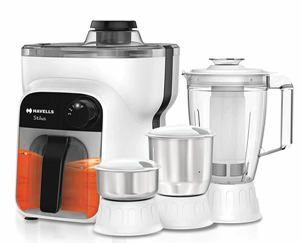 This juicer mixer grinder from Havells comes with the powerful blades and smart speed control options that let you operate it very smoothly. Get an effortless and timeless cooking experience with this model. This one model from Maharaja Whiteline is surely be the great purchase for your kitchen. Delicious foods rely on best spices and it will really help you in making and grinding the perfect spices for all your recipes without eliminating the natural taste. Also, the juicer attached with it let you make the fresh juices whenever you want. It comes with three versatile jars equipped with powerful blades that make your task easier in the kitchen. 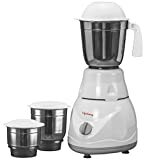 The Havells Stilus Juicer Mixer Grinder is an excellent buy for dry grinding, wet grinding, juicing, chutney making, and blending. 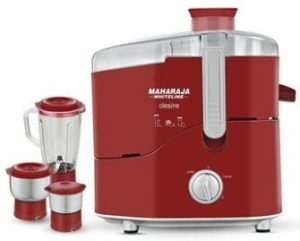 This one comes with three normal jars having the capacity of 400ml, 1 l, and 1.5 l, respectively and one juicer jar with the capacity of 1 l along with a fruit filter too. There comes a specially designed bigger sized stainless steel sieve ensuring the proper and effective cutting of fruits. It also has a bigger pulp container for hassle-free juicing and can collect approx. 2 kg of pulp in one go. You can easily operate the appliance at desired level of speed as it comes with three-speed settings with the pulse feature. Moreover, this juicer mixer grinder is also featured with non-slip feet that prevent the movement of the grinder while in operation. 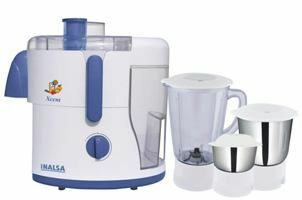 The Inalsa Xcent Juicer Mixer Grinder comes with an appealing design to add a grace to your kitchen interiors, and yet its powerful performance can do all the hard task of grinding, mixing, and juicing very efficiently. It is featured with 550 W power that ensures more optimized performance. 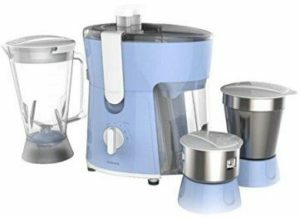 This juicer mixer grinder comes with three highly durable and strong jars that include 1.5-liter transparent liquidizing jar, 0.8-liter multi-purpose jar, and a 0.4-liter chutney jar. Even more, the three-speed settings allow you to blend and grind by gradually increasing the speed without overheating the motor. Plus, the automatic shut off feature of this juicer mixer grinder saves the appliance from being overloaded or overheated. 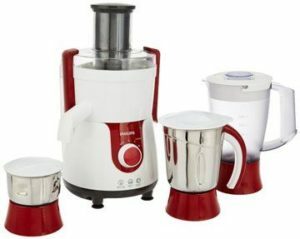 And the next is Sujata Powermatic Plus + CH Juicer Mixer Grinder which comes with a lot of unique features and great performance. 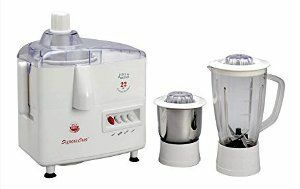 This multi-purpose appliance not only aids you in mincing and grinding meats, cutting vegetables, grinding spices, and whipping creams but also you can make fresh and healthy juices with it whenever you want. 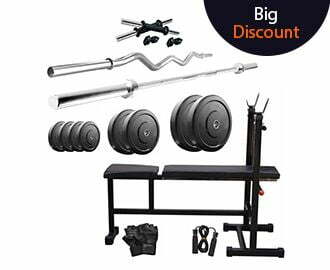 The best part is that it comes with extra sharp blades for the more enhanced performance and get remains the same even after the regular use. It has two jars, one liquidizing jar of capacity 1.5 l to mix and blend large quantities of food and the other is grinder jar of capacity 0.3 l.
The appliance has anti-skid feet to prevent it from slipping while in operation. And talking about its other features, it also comes with a cord winder and micro safety switch mechanism for your convenience. Plus, the ergonomic buttons makes it more comfortable and convenient to use. 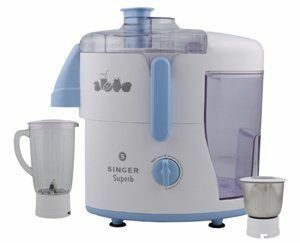 The Singer Superb juicer mixer grinder is a must-have appliance for every homemaker who needs to prepare a quick, healthy and delicious food in no time. It is your perfect kitchen companion to whip up tasty gravies, blend the ingredients perfectly and make fresh juices. The appliance comes with three-speed settings that you can increase gradually to avoid the overheating. And its powerful motor enhances the performance of juicing, grinding, mixing, and pureeing. This juicer mixer grinder from the brand Signora is another smart choice for all your dry grinding, blending, mincing, and wet grinding needs. Plus, you can also make fresh and healthy fruits and veggie juices very efficiently with this appliance as it comes with a juicer also. It is equipped with a powerful 500 W motor for effective and efficient performance. The appliance comes with three-speed control options that let you choose the desired speed for juicing and grinding. And this way, it offers you to get the exact consistency you want. There is also a pulp collecting mesh for all the juice lovers to enjoy no pulp juices. This juicer mixer grinder comes in a very sleek and compact design letting you store it more conveniently, even though adding a style to your kitchen interiors. This is all about best juicer mixer grinders that we have picked for you. All these models are the latest ones with amazing features that will surely make your task easier in the kitchen. Also, all these models we have listed are based on their specification and buyers’ feedback, as well as ratings. So you can choose the one accordingly. But if you feel anything is missing in the blog or for your any suggestion, please write down in the comment section below.